Four years after the Pentagon suspended the security clearance of Rahim Sabadia — a South African-born, California-based defense contractor who has bankrolled the Council on American-Islamic Relations (CAIR) — new discoveries raise questions about how he had been permitted to hold one in the first place. Documents analyzed by Islamist Watch show that Sabadia's foundation donated to an infamous Hamas-funding charity and other radicals, that in 1985 he pleaded guilty to the sale of illegal listening devices, and that immigration officials had ordered him out of the country a decade earlier. Topping off this troubling record, Sabadia recently pleaded guilty to providing false information to a Navy procurement officer in a scheme to recapture an old contract. The Sabadia saga is a warning that Islamists and their sympathizers must be kept away from the sensitive technologies and institutions that protect America. Concerns about Sabadia initially came to light in a 2011 article by Matt Pearce and Brooke Williams for the Orange County Register. While researching the millions of taxpayer dollars that had been flowing to Sabadia's Sabtech Industries — thanks, in part, to earmarks from Gary Miller, a Republican congressman whose campaign chest was regularly filled by Sabadia and his wife — the journalists learned that Sabadia had lost his secret-level clearance in 2010. As a result, his company had to stop work on a lucrative contract to upgrade the Navy's Aegis combat system, a key component of ballistic missile defense. Federal agencies did not disclose the reason for the suspension, but Pearce and Williams located an internal email citing worries about "charitable contributions." The authors note that Sabadia, via the Sabadia Family Foundation (SFF), distributes money to "many Islamic education, relief, and humanitarian organizations," and "one of the foundation's large beneficiaries — receiving at least $1.2 million since 2002 — is the Council on American-Islamic Relations." CAIR has been on the outs in Washington due to its designation as an unindicted co-conspirator in the case against the Holy Land Foundation, a charity convicted in 2008 of funneling millions to Hamas. In another interesting CAIR–Sabadia link, Omar Zaki, Sabtech's onetime vice president, is CAIR's current national chairman. Sabadia's massive financing of CAIR, which has reached $1.296 million for its Los Angeles chapter based on available SFF tax filings (2001–12), as well as lesser support for similar Islamist pressure groups, certainly should have grabbed the Defense Department's attention. However, there have been far more disturbing recipients of the Sabadia family's largesse. The most notorious SFF grantee was the Holy Land Foundation itself, which collected $3,300 in 2001, the year that federal authorities finally shut it down. Also enjoying Sabadia's generosity in 2001 was the American Muslim Foundation, which pocketed $700. That organization was led by the high-profile Islamist Abdurahman Alamoudi, who is now serving a long prison term following his role in an international assassination plot. Additionally, the SFF has gifted $1.177 million (2001–12) to Islamic Relief USA, which is a subsidiary and funder of Islamic Relief Worldwide, a charity that, according to an Americans for Peace and Tolerance report, "has multiple associations with Hamas fundraising and with the Muslim Brotherhood leadership in the U.S., Europe, and Sudan." The SFF's roster of beneficiaries also betrays a fondness for radical mosques and imams. In 2001, the foundation gave $4,500 to Oakland's Masjid Al-Islam, which, in the words of the Anti-Defamation League, is "affiliated with the anti-Semitic Sabiqun movement, which seeks to establish Islamic rule in the U.S." Even the Southern Poverty Law Center, known for vilifying critics of Islamism, calls Masjid Al-Islam and the Sabiqun network "hate groups." In 2002, the SFF sent $100 to defend Jamil al-Amin, an imam convicted that year of the 2000 murder of a Georgia sheriff's deputy. He has since been identified as the head of the Ummah, another entity striving for an Islamic state within U.S. borders. In 2007, the SFF contributed $25,000 to Brooklyn's Masjid At-Taqwa, which the New York Police Department classified among the city's "tier one mosques of concern." That is largely due to the influence of Imam Siraj Wahhaj, who was listed as one of the "unindicted persons who may be alleged as co-conspirators" in the 1993 World Trade Center bombing and the foiled follow-up attacks. Wahhaj, too, dreams of a Shari'a-governed America. Sabadia's run-ins with the law should have raised further red flags for those vetting him. On January 21, 1985, Sabadia was hit with a seven-count federal indictment (Central District of Illinois) for selling electronic devices "primarily useful for the purpose of the surreptitious interception of wire or oral communications," contrary to Title 18, U.S. Code, Section 2512. Investigators had caught him peddling "telephone drop-in FM transmitters," "ink pen FM transmitters," and "'snooper' contact microphones." Sabadia pleaded guilty to three counts and was sentenced to three years of probation for each, set to run concurrently, and insignificant fines and restitution. Besides outing his past criminality, the 1985 court papers expose Sabadia's former name, Abdur Rahim Noormohamed, which can still be found on various websites. It turns up somewhere else as well: in documents that place Noormohamed/Sabadia at the heart of an immigration dispute during the 1970s. According to a decision from an Immigration and Naturalization Service (INS) district director dated May 23, 1977, Noormohamed/Sabadia entered the U.S. from Switzerland in January 1976 on a nonimmigrant visa for business in New York on behalf of a textile company. He soon went to Dallas and joined his brother Moosa in a separate venture exporting electronics. When his six-month admission was nearly up, Noormohamed/Sabadia applied for permanent residence based on the claim that he was a qualified investor. The INS official ruled that he did not meet the requirements, rejected his application, and instructed him to leave the country, declaring: "It can only be concluded that you and your brother did not enter the United States in good faith as nonimmigrants without any intention of circumventing the quota restrictions of the Immigration and Nationality Act, as amended." In other words, they had planned to remain in the U.S. from the start. The INS district director dismissed a motion to reconsider his decision, the INS regional commissioner affirmed the denial, the U.S. District Court for the Northern District of Texas backed the INS, and the Fifth Circuit Court of Appeals approved the ruling. Yet Noormohamed/Sabadia managed to stay. A document from a legal case explored below notes that he married Nafees El Batool in 1979 and became a U.S. citizen in 1989. Sabadia's history prompts a pair of obvious questions: First, if Sabadia's charitable giving had indeed inspired the Pentagon to take a closer look at his security clearance, why did this issue not come to a head until a decade after his foundation had begun supporting Islamic radicals? Second, with a determination that he "did not enter the United States in good faith" and a conviction for selling equipment applicable to espionage, why was he entrusted with a clearance at all? It can now be revealed that Sabadia responded to his lost clearance by breaking the law once again. Pearce and Williams' article sets the stage: On March 3, 2011, they write, "three Sabtech employees created Primary Tech Systems" at "the same address as Sabtech's Virginia office. Sabadia would not discuss the purpose of the new company and said he has no financial stake in it." His involvement was deeper than he let on. But while attempting to deceive a journalist is one thing, attempting to deceive the U.S. government is another. Last year, federal prosecutors charged Sabadia with making "a materially false, fictitious, and fraudulent statement and representation in a matter within the jurisdiction of a department or agency of the United States during a  telephone conversation with a civilian procurement officer at the Naval Surface Warfare Center, located in Dahlgren, Virginia, in the Eastern District of Virginia, by denying that he exercised control or direction over the activities of Primary Tech Systems (PTS) and its corporate officers." In reality, "the creation of PTS was his idea, he ordered its incorporation, he hand-picked the three officers of the corporation, and he directed the activities of its officers." Sabadia's deliberate untruths violated Title 18, U.S. Code, Section 1001. He pleaded guilty. "Sabadia devised a plan to create a separate corporation that would contract with the government and outsource some of the actual work to Sabtech," reads the statement of facts accepted by all parties. Sabadia's position "was explained as that of a mere advisor and subcontractor." His "ultimate goal was for PTS to obtain the services contract that Sabtech had lost when it lost its facility clearance. Navy officials made it clear to PTS officers early in the negotiation process that because Sabadia no longer held a security clearance he could have no control of PTS in order for PTS to be eligible to obtain the contract," which apparently was for the Aegis project. A court document divulges that PTS placed a bid worth $10 million in November 2011. Prior to Sabadia's sentencing on March 20, 2014, the government described him as "unafraid to violate the law for personal gain" and branded his actions "intolerable," arguing that "with so much at stake in the way of lives and treasure, the defense procurement system can only function properly if prospective contractors are honest during negotiations." However, prosecutors also applauded him for being "generous to others with his time and money" — a positive spin on those alarming contributions. In line with their soft recommended sentence, Sabadia was handed 24 months of probation, with $6,694.82 in probation costs, and a $25,000 penalty. He could have been imprisoned for five years. Sabadia escaped once more with a wrist slap, but at least the Pentagon seems to be wising up to him. A Navy memorandum lists Sabadia, Sabtech, PTS, and specific PTS officers and owners, including Sabadia's daughter Aisha, among those suspended by the acquisitions bureaucracy in September 2013. Yet will Sabtech and Sabadia live to fight another day? The 2011 article quotes Sabadia speaking of an organizational shakeup to rehabilitate Sabtech's standing with the Defense Department. This has unfolded methodically. 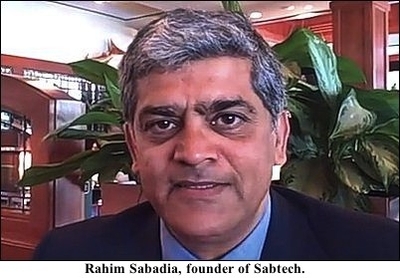 Businessman Michael Carter became Sabtech's new president in August 2012; Sabadia switched to chief executive officer and chairman. Sabtech promoted Carter to CEO in July 2013. Finally, on December 5 — just two weeks after Sabadia's signing of the plea agreement, which notably features a pledge not to indict Sabtech, and one day before its filing — a press release making no mention of Sabadia announced that Carter had purchased the company. But is Sabadia's influence truly gone? Given past machinations, skeptics will wonder if he or any family members — such as Yusuf Sabadia, who represented Sabtech at a conference last fall and was referenced on the firm's Twitter account as recently as late January — still hold sway there. Three things, however, are certain: First, it is distressing that a person with Rahim Sabadia's baggage was able to acquire a clearance and maintain it for as long as he did. Second, other than interactions needed to monitor his probation or investigate any further lawbreaking, the government should keep its distance from Sabadia in the future. Third, an Islamist-aligned individual with classified access has the potential to do far greater damage than the chicanery and quest "for personal gain" witnessed above. The nightmare scenario will come to pass unless Washington more robustly recognizes and acts on the dangers posed by Islamist penetration of the security apparatus, both military and civilian, that protects our country from the resurgent jihad.